The return of Fear the Walking Dead is just over one month away and the man behind the madness has given his thoughts ahead of the new season. In this exclusive interview with Executive Producer and Showrunner Dave Erickson, we find out what is in store for the characters in Season 2, including new threats from the living and the dead, as they embark on an ocean survival adventure. 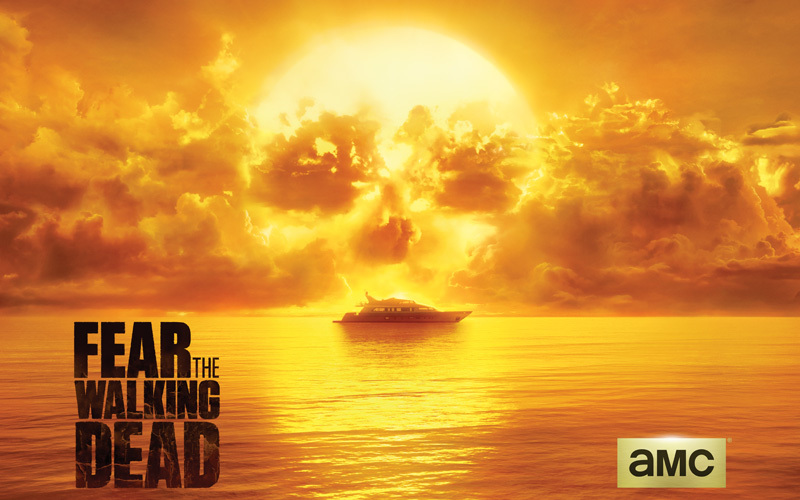 From his preview and the stunning new poster depicting Strand’s boat ‘Abigail’ sailing into a terrifying sunset, we’re now even more excited for Fear the Walking Dead: Season 2! 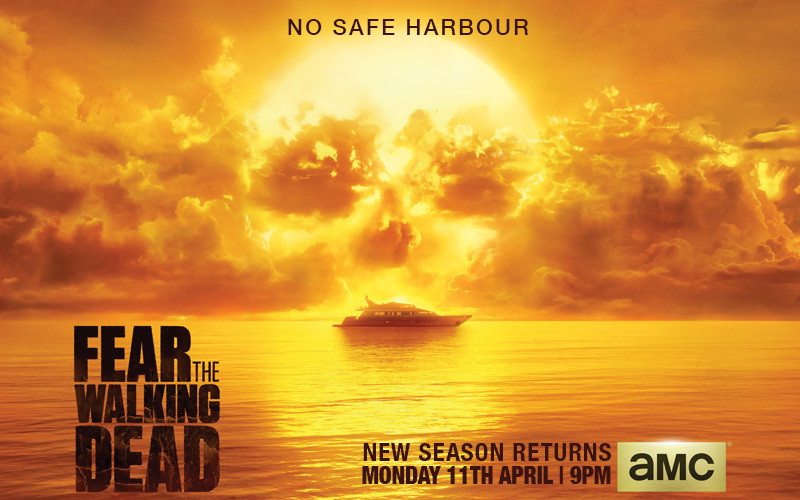 Watch it exclusively on AMC from BT every Monday at 9pm from April 11th! Question: How is “Fear the Walking Dead” distinct from “The Walking Dead” and is it easy to become hooked on “Fear” if you’ve never seen “The Walking Dead”? Dave Erickson: “It’s definitely easy, and you don’t have to know anything about “The Walking Dead” to become hooked on “Fear”. Speaking with lots of people – with the actors, the producers and some viewers – they all agree that the way we approached the story means you don’t need any prior knowledge of the comics or the other series. But we’ve structured it in such a way that if you are a fan of the original graphic novels and you watch “The Walking Dead”, you’ll immediately recognise the mythology and you’ll see how the stories are layered. But you’ll also appreciate the different approach that “Fear” takes; the different point of view it has. Question: Each family in season one experienced some tremendous loss. Will this unite them in season two and does it help them try to figure out how to survive? 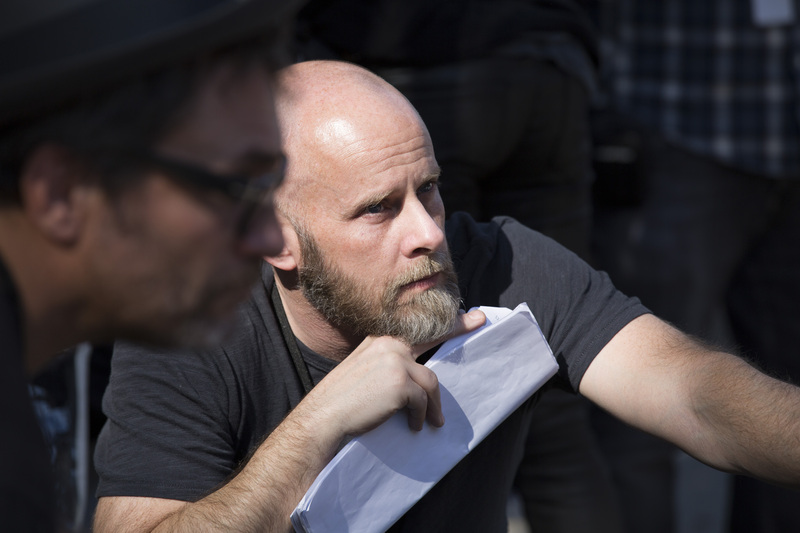 Dave Erickson: ”Well, it’s interesting because one of the things that was important to Robert Kirkman when we started to develop the drama was the theme of violence and how each of the characters would approach it. And that doesn’t just mean the ‘deaths’ of the infected but how would each of the characters react when they had to put someone infected down? “By the end of season one, they’ve experienced a zombie horde and most of them (with the exception of Travis, Chris and Alycia) have had to fight one of the infected and put onedown. So it becomes a question of the effects of that violence and about the morality of each person – how will they learn to process everything as we go into season two? “They’ve also witnessed what is tantamount to the fall of Los Angeles. The scenes in which they drive through a desolate, abandoned, dead LA mean that they’re leaving their home behind. They’ve lost their home, their friends, their neighbours and it’s catastrophic. I think that initially they’re all quite shell-shocked by it and then it becomes more about the connections they develop and, of course, their relationships with violence. “Now, in season two, they’ve landed on Strand’s boat, on the ‘Abigail’, and I think what we’ll come to realise, very quickly as we move into the first couple of episodes, is that they were not the only people with this bright idea. They’re not the only ones that have decided to become refugees from Los Angeles and make a break for the water. That’s going to create additional conflicts. It’s going to be twofold: what do they do when they’re confronted with the infectedand what will they do when confronted with other survivors? How do they approach them and where does the greater danger lie? Question: Strand said at the end of the season one: “The only way to survive a mad world is to embrace the madness.” So how does this actually play out in season two? Dave Erickson: ”I think a big theme for season two of “Fear” is that once we’ve established that the world is really gone, once we’ve established that there’s no turning back, what kind of person will each of the characters become? Will they be able to surrender to it? Will they be devoured and consumed by the apocalypse or will they change their base nature? Can they really continue to fight against it and try to hold onto their humanity? “That was something we began in season one, specifically with Travis, and I think we’ll see it continue in season two. One of the things that both Liza and Madison said about Travis was if he had to put either one of them down, it would break him. I think one of the interesting questions for this season is, did that act make him a broken man or will he be able to hold it together, not just for himself but for Chris, specifically, who’s just lost his mother? Question: Speaking of Daniel Salazar (played by Ruben Blades), there were some very dark moments about his past hinted at in season one. Will more of this be unveiled during season two and how will that affect his relationship with his daughter Ofelia (played by Mercedes Mason)? Dave Erickson: ”In season one, we came to realise that Daniel was definitely not a humble barber. The truth is, he’s committed atrocities; he’s committed some truly violent acts in his past. His wife Griselda knew. She didn’t necessarily know the details but she knew. But she was willing to support him and even offer him absolution but now she’s gone. But his daughter Ofelia has only just become aware of this side of him and she’s looking upon him with judgement. Ofelia has spent much of her life protecting her immigrant parents, feeling that they were a bit backwards; that they were of ‘the old world’ and that they struggled to assimilate into their lives in the US. Question: There is a revelation from Nick (played by Frank Dillane) in the season one finale that he admitted to living in his own apocalypse as a drug addict and that other people were now starting to catch up. How important is this to his character development in season two? Dave Erickson: ”It’s a huge part of his development. At the end of last season, Nick essentially has a moment of clarity. He sees the world falling apart and, for the first time he’s clean from drugs. He’s not going to be able to score again. So, he realises that he’s somebody who should have died many times over in his previous life and now has to ask himself how and why he survived. Question: The infected in “Fear” are in much less of a decayed state than the zombies in “The Walking Dead”. How does this affect the way in which the characters react to them? Dave Erickson: ”Well, we’re a little bit further along in season two so they’ll have decayed a bit more and atrophied a little. And there are other factors and elements. We’re in salt water in the ocean and under a baking hot sun. So you’ll see a progression in their appearance but fundamentally they’ve recently become the infected and it’s very difficult to put one of them down. That takes its toll emotionally. We’re actually humanising the dead, and we want to continue to show the weight and pressure that puts on our characters when they have to dispatch these ‘people’. Question: Why is it important that the infected don’t become just “cannon fodder”? Dave Erickson: ”Something that’s really interesting about the whole genre is that you can project any human anxiety, any phobia or any fear onto the undead. The thing about the zombie genre is that you’re then allowed to kill your fears. I do think there’s a certain catharsis to it: it allows you to take all the things you hate and all the things that keep you awake at night and then put them down in a very permanent fashion. Question: What was it like to shoot in Mexico? Dave Erickson: ”Well, shooting in Baja, we have a crew that is partly American alongside a lot of technicians and artists who came out from Mexico City and a lot of folks who are working locally in Baja. It was a giant endeavour and, as far as I can recall, there really hasn’t been anything like this done for television before. It was new ground for all of us, for the writers, for the directors, for all the producers and for the network. That’s a really rewarding feeling and I think we’re going to give the audience an experience that they haven’t had before. “‘Fear’ is a really diverse show and that’s really important to us. When we were shooting in Los Angeles, it was in East LA, exploring neighborhoods that don’t appear on TV or in films too often. Working in Mexico has continued that theme. It’s been great to be able to work with Mexican directors, writers and craftspeople and Bernardo Trujillo, our production designer, is based in Mexico City and he has been remarkable with his energy and his unique, invaluable perspective. Question: Is there anything else that you’d like to share with fans about the upcoming season? Dave Erickson: ”I think the most intriguing question is this: We all know that we’re going to be on a boat because we saw that at the end of season one but… where are the characters going to go? “I think we’ll quickly realise that the ocean is no safer than land and that there’s a very different level of adversity and threat on the water. It forces the characters to set their sights on a destination. But where will that be? North to Vancouver or south to Cabo? This is a boat that has a really incredible range and a full tank of gas so, feasibly, they could head out across the Pacific for 3,000 miles or more and make it to Hawaii. We could even end up doing zombies in paradise! “That’s the intriguing question for the first few episodes of the new season: what harbor can the characters find and when they get there, will it be safe or not?